Discuss how to respect your opponents. 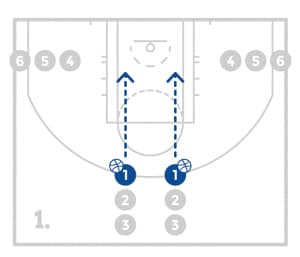 Have the players now start in a low good stance and walk and dribble forward to the other sideline. 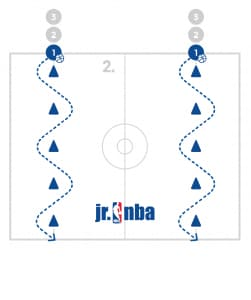 Once the players reach the other sideline they will then walk backwards using the same dribble all the way back. Keep the players in a good stance with their chest and eyes up. Remind them to use their fingertips and try to perfect their dribbling mechanics while walking. The players will find a line on the court and all stand next to it. The coach will identify 1 side of the line as land, and the other side of the line as water. 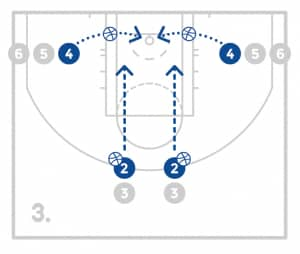 The coach will indicate whether to use two feet or one foot (right or left) and will indicate if the player will jump: back and forth, side to side or 4 corners. For 15 seconds the coach will say “land” or “water” and the players will jump to that spot. This drill forces the players to focus, balance and react quick. 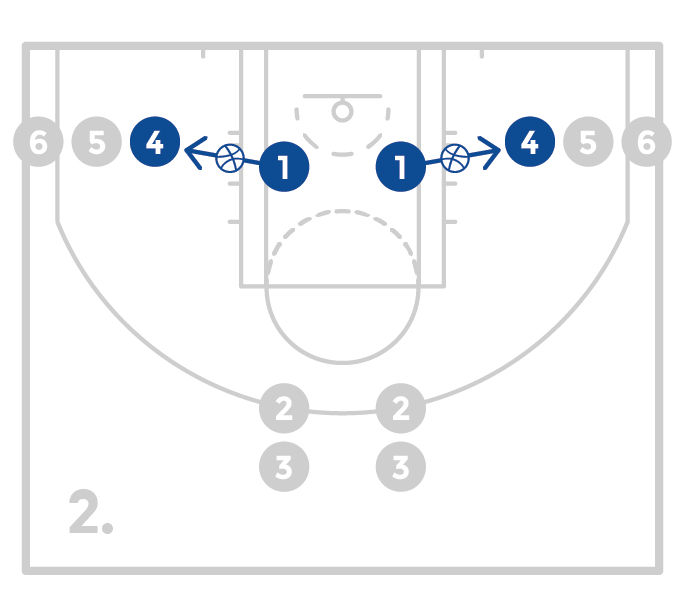 The players will line up in 2 lines, one on each side of the lane with both lines facing each other. 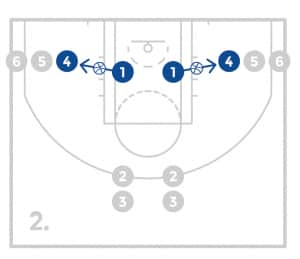 The first player in line will alternate pushing off the foot closest to half court trying to move as far across the lane as possible. 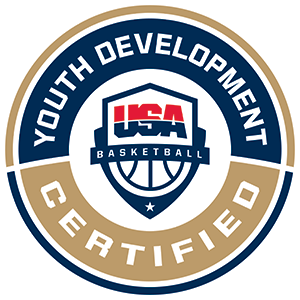 The players will land on the leg closest to the basket and quickly swing their outside leg around to put them in a nice shooting stance with there arms simulating holding a ball. The player will then go to the opposite line and the player from the opposite line will do the same. This process will continually repeat for a minute. 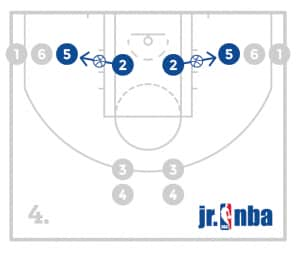 After a minute, the players will do the same push and square up but will now finish by jumping to simulate taking a shot and land the same spot they jumped from with their follow through up. 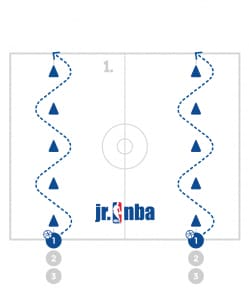 Add a ball tossed from 1 line to the line pushing across the lane to make it more realistic and add the shot if appropriate. Players should cover a lot of ground on the push out and work on landing on the inside foot and turning to square up and on balance.